Welcome to the all new Le Fab Chic! I did a full blog redesign and I’m excited to share it with you. The new layout is optimized differently for computer or mobile viewing to make it easy to read no matter where you are. There’s also lots of newness coming your way! I’ve been working on some fun fashion and beauty posts that I can’t wait to share. -More to Read! My goal is to have a new post up 3 times a week on Monday, Wednesday and Friday. Check back often for new things to read. -Make a suggestion! I’ll be focusing mainly on fashion and beauty with a few lifestyle post (think fitness, travel etc.) here and there. I always want to make this space fun and informational so please let me know if there’s any topic you’d like me to discuss. You can submit requests via the contact form. -Let’s be social! I happened to start my blog the same month that some MAJOR life changes started to happen. These changes took up a lot of time and energy which resulted in me becoming less social. I’m ready to have fun with my Le Fab Chic fam again so let’s get social. We can be friends on Instagram, Facebook, Twitter, Pinterest or Snapchat! -More giveaways! You’ll have more opportunities to win some really awesome prizes. Some giveaways will be hosted by me and others will be with my blogger friends. Make sure you’re subscribed and follow on social so you can be in the know when giveaways happen. Speaking of giveaways, here’s one you can enter now! See below for details. Good luck! Congrats on the redesign! Looking forward to your posts. Love that Kate Spade clutch. I love that clutch too! Great for many occasions. Thanks for reading, Gladys! Good luck! I am glad that I found you site. I am always looking for beauty and fashion tips. New tends. Fashion on a budget. Hi Nancy! Thanks for stopping by my blog. I’m looking forward to talking about beauty and fashion on a budget with you! The redesign looks great! It’s very chic 🙂 Very exciting giveawy too! Thanks E! Can’t wait to share more posts with you. Hey Julie! Thanks for stopping by my blog. Good luck! Your new site looks amazing! I just did the same and man does a refresh go a long way! Hi Lacey! Your blog looks amazing too! A refresh really helps get me motivated again. This is such a cool site! Love the way you laid out this post – super clear, easy to read and I GET everything you’re doing! Thank you so much Krista! I’ve been working on making things more reader friendly so I really appreciate your feedback. Thank you so much Sarah! Good Luck! Congrats girl!! The website is gorgeous and flows so beautifully! Thank you Nicholle! I really appreciate your feedback. Thanks for stopping by! Thanks Marshel!! I’m so excited to chat more with you! I hadn’t seen the old site, but I’m loving the new look! It’s clean and chic! Hi Amanda! Thanks for your feedback. I really wanted to make things look more clean on my site so I’m thankful for your comment. Great redesign! Thanks for the opportunity. Thank you for stopping by my blog Kim! Good luck! Congrats on the blog update! Looking forward to more content! Keep up the good work!! Hi AC! Thank you so much for your encouraging words. 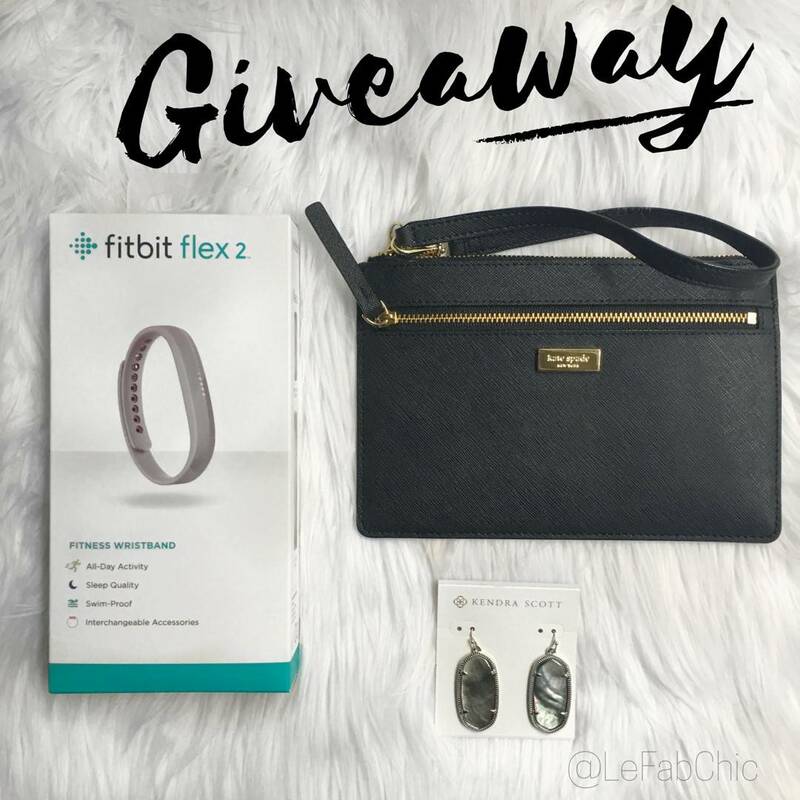 ooooo such a good giveaway to get active for summer! love it! Hi Elise! I thought it was a great motivator for summer too. Thanks for stopping by! Your website looks beautiful! Can’t wait to see more content. I love your design! Very clean and stylish! Congrats! Wishing you lots of success! Very excited about this giveaway. Thanks for the chance ! Love the new look! Hope to win! Your site is so pretty!! I love the design and awesome giveaway, girl! This is a great giveaway! I love those Kendra Scott earrings. This kate spade clutch is so cute!! This is so great babe!! Loving this site, also thats an amazing giveaway!! Spring is a great time to refresh! Loving the new design! I would love to try this FitBit 2! LOVE the redesign and this is an amazing giveaway! My wife would really love this! Such a great post! Love your site! I’m always looking for style and beauty updates. This would be great to have. Thanks for the chance..